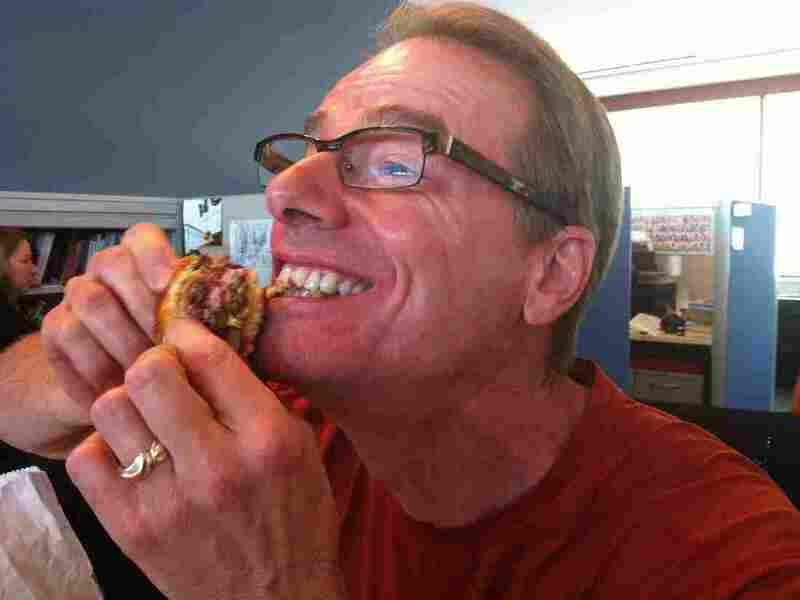 Sandwich Monday: The All-American Burger : Wait Wait ... Don't Tell Me! 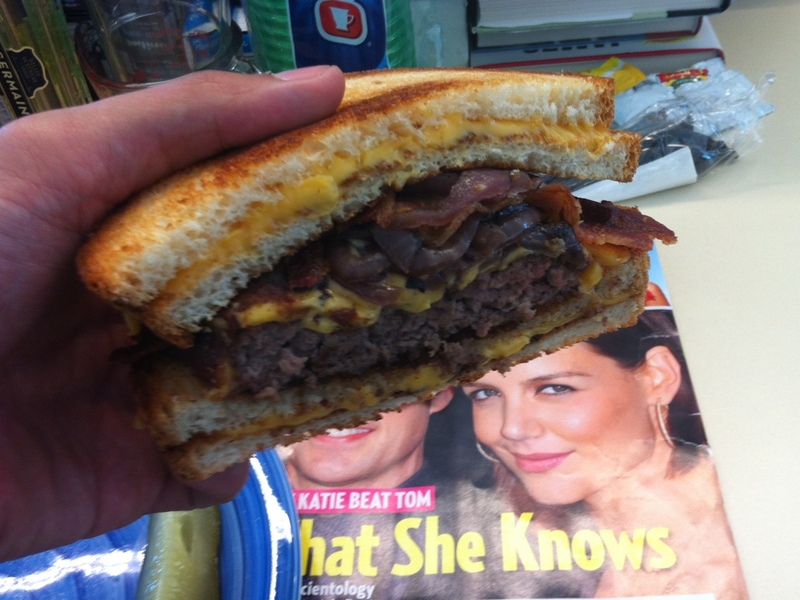 Forget everything you ever knew about buns: This week, we eat a burger in between two grilled cheese sandwiches. The Daniel family wrote in to recommend the All-American Burger from Saloon Steakhouse here in Chicago. We're not sure if they were recommending it because they thought we'd like it, or as a vicious plot to put us all in food comas, because as soon as we got to "burger between two grilled cheese sandwiches," we stopped reading and went to go get it. Eva: It's so annoying whenever I hang out with burger, grilled cheese is ALWAYS there too. Blythe: I feel like I'm just eating the entire kid's menu in one sandwich. Ian: You do feel bad for all the unemployed buns out there now though. Standing in the bread line, no doubt. With a couple slices of grilled bread, you can make even the most dangerous thing look innocuous in satellite photos. Blythe: As an indecisive restaurant orderer, this suits me. It's also better than the chicken caesar salad pot pie incident. Ian: I think we just passed from burger to burgest. 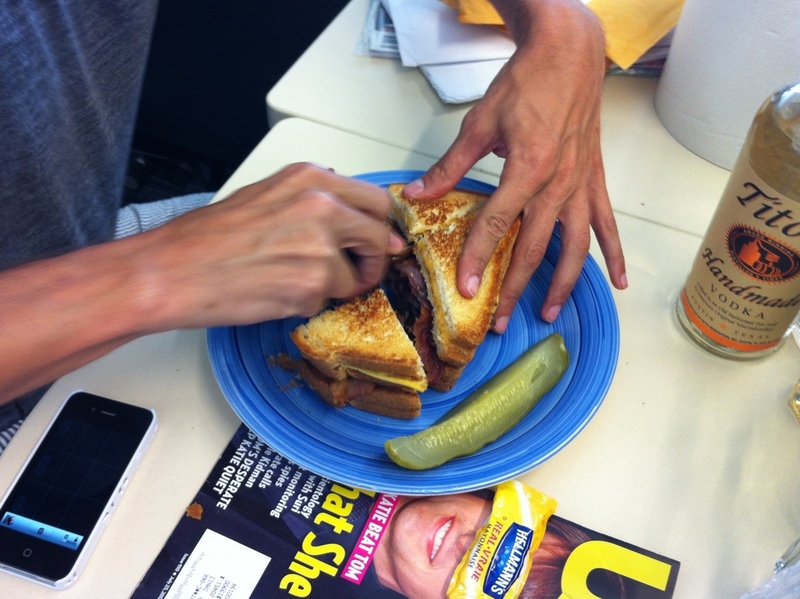 Ian cuts the sandwich into five healthy 1000 calorie bites. Robert: The other possibility was a grilled cheese between two burgers, but the grilled cheese lost the coin toss. Eva: So much in there I almost didn't notice the slice of apple pie hidden somewhere between the second slice of bread and the burger. Robert: Oh look, I found my car keys! This isn't an action shot. "Blurry Hand" is one of the first symptoms of cheese overdose. 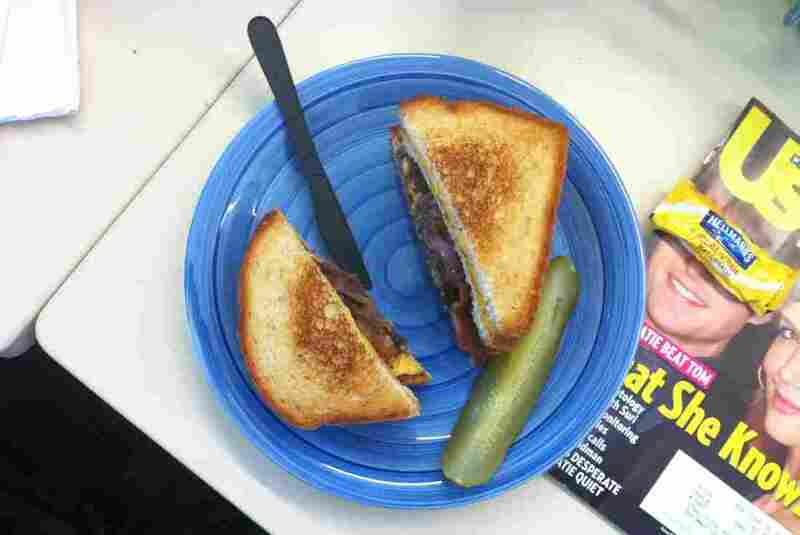 Ian: Grilled cheese, bacon, burger. This sandwich is both like a triathlon and the opposite of a triathlon. Robert: With all this beef and cheese it almost feels like the bacon is crashing the party. Except bacon is never an unwanted guest. Eva: This is what happens when cheese demands the limelight. Ian: Jokes with fruit in them have no place in this blog.